Indiana is now in the mix for class of 2017 five-star guard M.J. Walker, according to reports out of the Under Armour All-American Camp in Charlotte, North Carolina. The 6-foot-5 Walker is ranked the No. 24 prospect nationally according to the 247Composite. 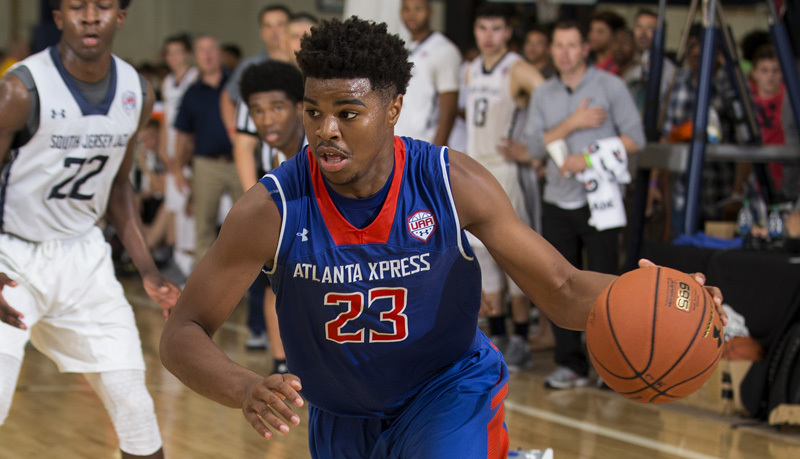 The elite wing plays for Atlanta Xpress on the Under Armour Association Circuit and plays at Jonesboro High School in Georgia. In a sitdown interview at the camp with Evan Daniels of Scout.com, Walker mentioned Indiana, North Carolina State, Cal and USC as some of the schools who have most recently become involved in his recruitment. Two other schools mentioned prominently by Walker were Maryland and Florida State. He’s a finalist for the USA Basketball U18 team that will begin training next week in Houston, Texas. Walker was the leading scorer this past spring on the Under Armour Association circuit at 20.7 point per game. He also averaged 4.2 rebounds and 2.2 assists per game. I Love his style! Good strong guard, with a B1G body! Great shot off the dribble! I like the way he finishes at the rim! Reminds me of Denzel Valentine. I’ll take two please. Holy smokes. This guy has the moves and shooting repertoire of an NBA player. Moves on the court extremely well. Already seems polished. After seeing us miss out on big physical guards like Brown and Alkins. I ‘d love to get this kid! Brown and Alkins were tough to lose. Big enuff, strong enuff and has the shooting touch to be a “one and done”. U know what that likely means? UK or UNC where academics don’t exist? great floater, hustles on D; gem which would be polished by CTC and IU.